Red Sail Sports is the proud owner of a fleet of three custom-built dive boats. 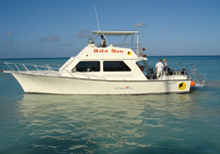 Its newest dive boat is the 'Biba Bon' meaning to "live well" in Papiamento. The boat is a sister to their other Pro 48 dive boat, the 'Pasa Bon' meaning "to have a good time." The Pro 48 is the industry's preeminent dive boat. Known for its expansive and open cockpit, quality craftsmanship, incredible maneuverability and running characteristics, the Pro 48 elevates diving to a whole new level. Measuring 48 feet in length, and featuring a 16 foot beam, the Biba Bon boasts an open deck space to comfortably accommodate 30 divers. 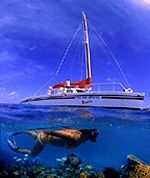 "Since Red Sail Sports limits its dive trips to 24," adds de Hoop, "this can provide divers with even more room." The bow offers a comfortable area for sightseeing and sun bathing. Twin drop down ladders, marine head and a fresh water rinse shower are all standard features of this luxurious dive boat. In addition, cold beverages, fresh fruit, tanks, weights and belts are provided on all dives. 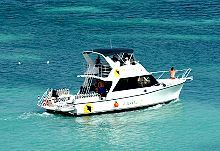 The custom designed dive boat 'Vista Mar' ("View of the Sea") is Red Sail Sports Aruba 40-foot dive boat. 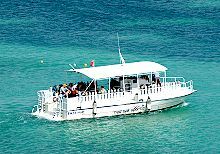 Crafted in the United States for operation in the waters of Aruba, the boat comfortably accommodates up to twenty-four divers. Like the 'Biba Bon' and the 'Pasa Bon' it was designed with a diver's needs and comfort in mind-fresh water showers, two fresh water rinse tanks, a spacious dive platform, dual entry ladders, restroom and advanced marine communications.